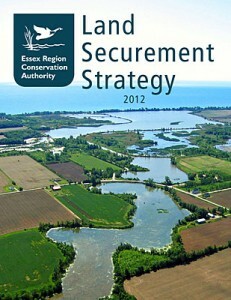 Orland Conservation completed a comprehensive land securement guidance document for Essex Region Conservation Authority in 2012. The ERCA Land Securement Strategy was developed to provide a strategic foundation for future ERCA land securement efforts by guiding permanent protection of the Region’s most biologically significant natural features. The report reviewed land securement methods appropriate for the Region, and provided recommendations on the implementation of a land securement program. The Essex Region Conservation Authority watershed is an area with low natural cover, the highest concentration of globally rare species in Ontario and one third of Canada’s rare plant and animal species all nested within one of Canada’s most important agricultural areas. ERCA has been actively acquiring properties since its formation in the 1970s on a project-by-project basis, including several acquisitions through its Clean Water~Green Spaces program.